Another clear winner this week. Jonathan Coleman announced his retirement from politics to take up a high paying gig in the private health system. Makes you wonder why he would have stood at the last election if his desire to be there was so tenuous. Perhaps it was the failure of the National Caucus to recognise his exceptional talents. More likely it was the powers that be realising with aghast what bad shape the health system is in. With news breaking this week that some Health buildings in Manukau have significant leaking issues and huge potential repair costs the questions what did he know and why didn’t he do something about it when he was Health Minister needed to be asked. After all he is still in the payroll. So Suzy Ferguson on Radio New Zealand decided to ask him that very question. You can listen to it here. The Spinoff website has handily compiled a transcript of what was said. Here it is. 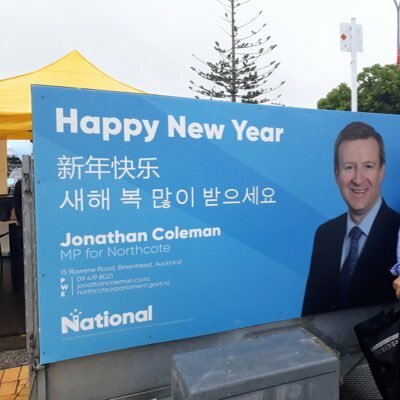 Susie Ferguson: … We are now able to speak to National’s outgoing spokesperson for health, Jonathan Coleman. This after Labour is pointing the finger at National, saying the problem with the rot at Middlemore Hospital buildings should have been addressed by the previous government. Mr Coleman is with us now. Good morning. Jonathan Coleman: Good morning Susie! SF: Were you told about the state of the Middlemore buildings? SF: Not explicitly? What does that mean? JC: No, no. It means that I’m aware, I’ve been aware over time that they need injections of capital to continue to develop the site, but I was not notified that there was any sort of problem along these lines. SF: But we had the former chair of Counties-Manukau DHB Lee Mathias on the programme just a few minutes ago, saying it was common knowledge there was mould within the walls of Middlemore Hospital buildings when she headed up the board a few years ago and that most people in Wellington knew about it. How did you not? SF: That seems astonishing minister that if most people in Wellington at the ministry were aware of this, and the Counties-Manukau chair knows about it and the health minister doesn’t, isn’t that stretching incredulity to breaking point? SF: Why would people keep this from you, though? JC: I don’t know, but I was informed this was not the topic of the interview so I’m a bit disappointed that once again Radio New Zealand ring up and say they want an interview on something which was simply my exit from politics and then make it about something else, but anyway, there you go. SF: You’re saying you had absolutely no knowledge of this? JC: I’m walking with my kids, and I’m leaving politics, so thanks very much Susie, bye-bye. Coleman claimed he had only agreed to one question being asked at the end of the interview but surely former Ministers should be available to be questioned on important issues that arose under their watch? Isn’t this the way democracy is meant to work? Twitter had a field day. RNZ headline: "Hospital buildings full of rot and mould". Big thanks to the people of Northcote, you really coughed up a right tosspot in coleman. Adam, in mitigation can I say I voted against the poisonous snake every time and let everyone who would listen my opinion of the bloke. Tough job in this electorate though. Northcote was held by Ann Hartley for Labour, from the 1992 election, until Coleman won it in the 2005 election. So all is not lost. If Labour runs a strong candidate in the upcoming by-election, it could grab the seat back from the Natz. Not a single Gob Bluth Segway gif. So many choices. Dude needs a special prize. Coleman an elitist snob who’s job was to rundown the health system to make way for more privatization. And the private sector has rewarded him handsomely for it. A horrible man. Ryall did the hard yards in breaking it down so numpties like Coleman could continue tightening the vice. JC’s a total sellout however let’s not forget the prime mover and shaker was ryall who also oversaw the power generator flogging then shot through to his sinecure in 2014. A real neoliberal at heart ? Thought James Shaw might get a look in here, but agree it’s impossible to compete against Coleman. A look in ? In an Auckland seat ? Sorry, I meant a look in for doofus of the week. Just my opinion but handing the Nats his questions does little for the new government. It confirms the ridiculous trait of effectively pre prepared answers. I agree that ambush and gotcha are not helpful but neither are effectively staged interviews. The no surprises policy was so widely used by Nats, arguably wider than ever intended it beggars belief he didnt know. Of course now he is CEO of a company that has 3 hospitals available for rent! To help Key and English get their obsessive surplus he forced cut after cut from our health services. He is proud of reducing their debt but overlooks the deaths and suffering as a result. They were in debt cos they have been underfunded for decades. He cut deeper and savagely. I heard that interview. Such as it was… Some time after he’d hung up on her, Susie Ferguson read out the text of RNZ’s e-mail request for an interview. That made clear that RNZ had indeed indicated that they wanted to talk to Coleman about the Middlemore issue, as well as about his resignation. So: not a gotcha. Coleman is a mendacious little shite, as well as having done zip in the health portfolio during his tenure. I agree. This latest example to avoid accountability shows Coleman’s lack of integrity. How despicable. but I was informed this was not the topic of the interview so I’m a bit disappointed that once again Radio New Zealand ring up and say they want an interview on something which was simply my exit from politics and then make it about something else, but anyway, there you go. And the fact of the matter is that there’s no other way to read what he said there. He only turned up because he thought he was going to get to grandstand. Like Key they only ever want to grandstand, he demanded all questions were known in advance so he could prepare the spin. They’re also not used to anything other than patsy questions from our owned docile obedient media. RNZ is still pretty pissweak IMO. I love that Coleman has some ideas about who coukd stand in Northcote but National has a selection policy that you cant interfere with… er do cameron slater and lusk and Mitchell know this? The term “doofus” to my mind implies someone essentially harmless who’s made a prat of himself. Mr Coleman (he doesn’t merit the title “doctor”, not being a practising medic or an educator) is far worse than that, at least on the evidence offered here. Maybe another level should be added to this award, one that recognises serious ineptitude or malice.